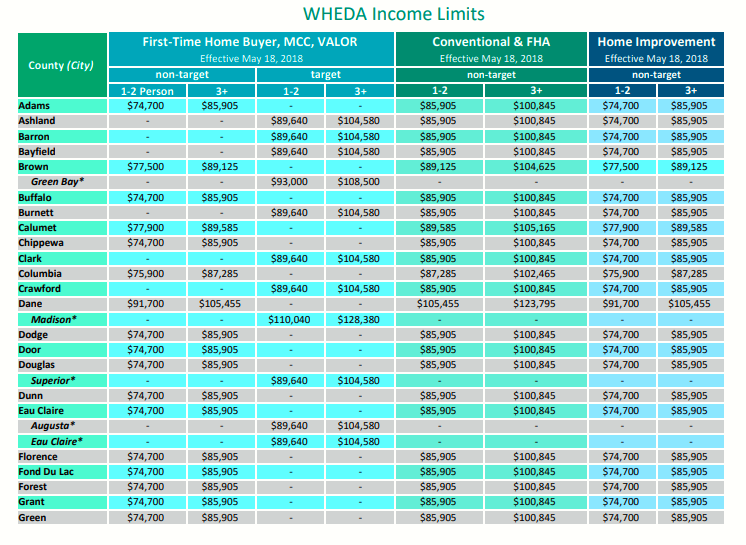 WHEDA is a versatile program that first time home buyers find very useful. Although it’s not limited to first time buyers, it is often used by them because of it’s low rates and no down payment option. It comes in FHA and Conventional versions and each have their own guidelines. It’s a recognized loan program in our area and is becoming very popular among many lenders. 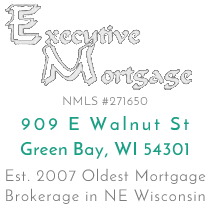 WHEDA (Wisconsin Housing and Economic Development Authority) is a Wisconsin based loan that is specifically for Wisconsin residents. It has certain attributes that make it one of the most unique programs available, and because of these attributes it is useful for first time home buyers. Although not limited to first time home buyers, we see that is where the most WHEDA loans are issued. WHEDA is 1 of 3 loans that require no down payment. The other two are a VA Loan and USDA Loan. This is why we often see it being used for first time home buyers. There is a 3% “down payment” required, but WHEDA allows you to finance that in a 2nd mortgage. This 2nd mortgage closes at the same time as the first. You buy a home for $100,000. WHEDA requires 3% down payment. You get 1 mortgage at $97,000 and 1 mortgage at $3,000. Both mortgages are the same interest rate and fixed rates. 1st mortgage is a 30 year fixed and the 2nd mortgage is 10 year fixed. You now pay both these mortgages on a monthly basis with no pre-payment penalty. Conventional WHEDA: This is a standard Conventional Loan and has the same guidelines as any other Fannie Mae / Freddie Mac Conventional loan. This version comes with or without mortgage insurance. FHA WHEDA: This is FHA version of WHEDA, with the same down payment guidelines, and mortgage insurance guidelines as standard FHA Loans. This version has the same mortgage insurance guidelines as FHA loans. Who Qualifies For a WHEDA Loan? 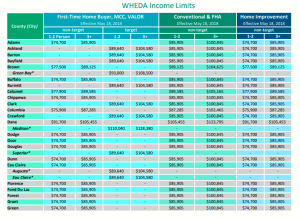 Much like a USDA Loan, WHEDA has high and low income limits they adhere to. The income is driven off household pay even if not everyone in the household is on the loan. This means if you are doing the loan in just the Wife’s name, the husbands income is still factored into the limit. How Do I Apply For a WHEDA Loan? Only certain lenders are allowed to do these loans, WHEDA has a very particular group of lenders they are willing to do business with. We have been one of the top producing WHEDA lenders because of our relationship with the authority. If you would like to see if you qualify please Click Here.